Come hell or high water, Boston Celtics coach Red Auerbach was going to diversify the National Basketball Association. He broke the league’s color barrier when he drafted Chuck Cooper in 1950, and 14 years later he introduced the first all-black starting lineup. Auerbach completed the trifecta when he retired in 1966, clearing the way for Bill Russell to become the NBA’s first black head coach. In his final three seasons, Russell not only coached the Celtics, he also played for them. He won two of his 11 NBA championships as a player-coach. Before the 1965-66 season, Auerbach announced that he would retire from coaching to focus on his general manager responsibilities. So after Boston defeated the Los Angeles Lakers, 95-93, in Game 7 of the NBA Finals for Auerbach’s ninth title, he stepped down. Russell agreed to become coach on April 16, 1966. In Russell’s first season as player-coach, his biggest challenge was Philadelphia 76ers big man Wilt Chamberlain. Chamberlain led Philadelphia to 68 wins and ended the Celtics’ stranglehold on the East. The 76ers defeated Boston in the Eastern Division finals, 4-1. That was the first time in a decade that the Celtics didn’t make it to the NBA Finals. 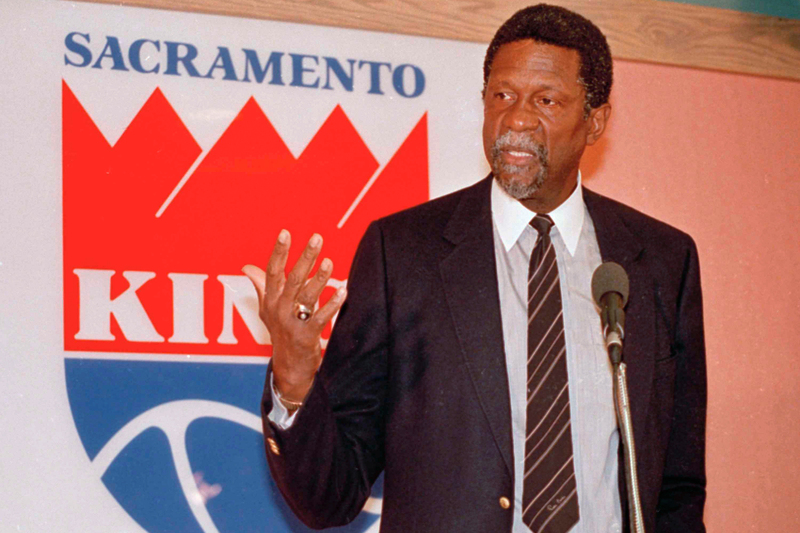 Former Celtics star Bill Russell talks to reporters in Sacramento after he was named the new coach of the Sacramento Kings in the NBA, April 28, 1987. But the following year, Russell’s team got revenge on Chamberlain and the 76ers, winning the Eastern Division finals, 4-3. Dr. Martin Luther King Jr. was assassinated during the series. That was tough on the players, especially Russell, who was a civil rights advocate. The Celtics defeated the Jerry West-led Los Angeles Lakers, 4-2, in the NBA Finals, and Russell won his first championship as a player-coach and 10th title overall in 12 years. The sophomore coach also won Sports Illustrated’s Sportsman Of The Year award. Russell went out on top with his second championship as a player-coach and 11th overall by defeating West and the Lakers, 4-3, in the rematch of the 1968 NBA Finals. Boston retired Russell’s No. 6 jersey in 1972, and three years later he was inducted into the Basketball Hall Of Fame.